Refund Policy: Because all our Mac software is "Try Before You Buy" and can be tested thoroughly before registration we encourage you to download the free demos and make sure that they meet your requirements before you register them since we do not issue refunds under any circumstances. MacLoggerDX The Swiss Army Knife of Amateur Radio ! MacLoggerDX logs into your favorite Telnet DXCluster and as DX Spots are received, tunes your radio to the spot, looks up the call and displays the DX station on the real time grey line Map with distance and bearing from your station. If you decide to work the station, MacLoggerDX is ready to instantly add the QSO and your Radio's VFO information to your log and can swing your beam around to work the station Direct or Long Path.MacLoggerDX supports ADIF Import/Export which is fully compatible with eQSL.cc and the ARRL LoTW. MacLoggerDX HD for iPad is an Amateur Radio application that monitors the spots from your favourite DX Cluster for DXing, Contesting or casual rag-chewing. It Alerts you to rare contacts or band openings by looking up and displaying real time propagation paths on a zoomable map. MacLoggerDX HD can log your contacts to a super fast sql database. MacLoggerDX HD includes ADIF import, export and Log syncing with MacLoggerDX desktop! MacDoppler will provide any level of station automation you need from assisted Doppler Tuning and Antenna Pointing right on up to fully automated Satellite Gateway operation. Automated downloading and update of keplerian elements - Track List sorted in real-time order of next pass - High Resolution Maps from "The Living Earth, Inc." - Full predictive dead spot crossing so that a pass is never interrupted by the beam heading passing a dead spot. - Speech advisory of next satellite AOS and Maximum Elevation. - Horizon Window shows upcoming passes on a time line. - Tuning Dial Tracking allows you to tune the downlink from your radio’s front panel while MacDoppler automatically adjusts the uplink. dogparkSDR is the first Native Mac client for the Flex Radio Systems Signature series SDR Radios. dogparkSDR is a native Mac application window into your FlexRadio 6000 radio. It takes care of setting and displaying radio parameters, displaying the Panadapter and Waterfall as well as routing the radio audio in and out of the Mac. DXCluster spots from MacLoggerDX and dpSDR Memories are displayed in the panadapter and can be clicked for quick tuning and lookup. CallBook for iPhone is an Amateur Radio application that allows you to look up call signs via the free WM7D server, the QRZ Online subscription service or the HamCall subscription server and track active APRS stations on www.aprs.fi. Lookup results can be emailed and the QTH can be instantly viewed in the Maps application. MacMemoriesManager wrestles unruly rig memories to the ground. Save multiple memory files for different situations, and switch easily from profile to profile. iSpectrum Analyzer is a simple and easy to use audio spectrum analyzer that allows the user to view live audio in a standard frequency plot as well as a waterfall display. The user can adjust the display resolution and save images to disk. MacEchoTelem...from N3RZN & VE3VRW. 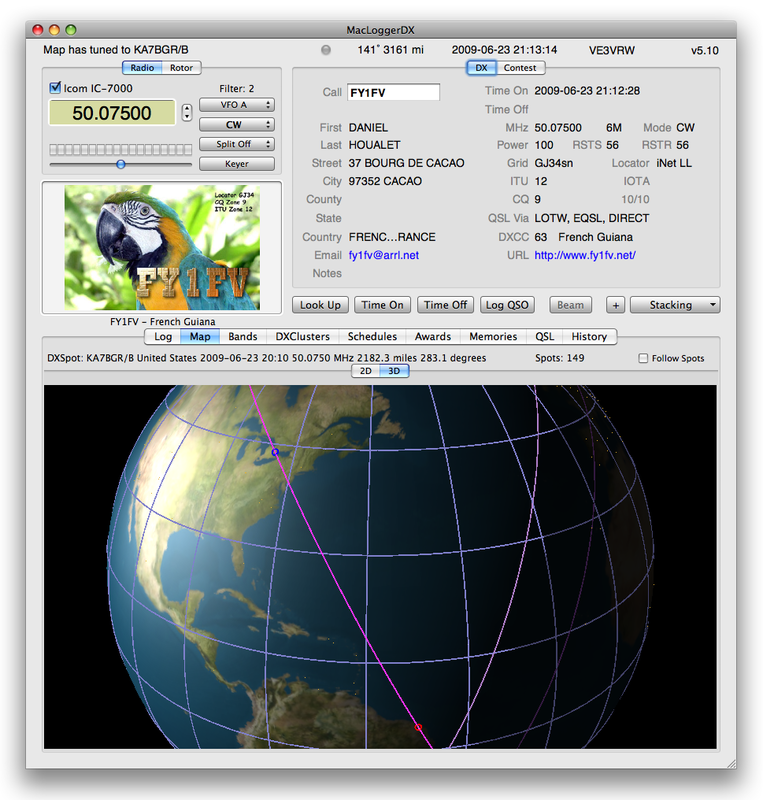 MacEchoTelem allows you to capture and decode live telemetry from ECHO, AMSAT's newest satellite, launched June 29, 2004.